First of all, please shut down your Dell Latitude E5400 / E5500. Disconnect the power adapter and remove the battery. 1. 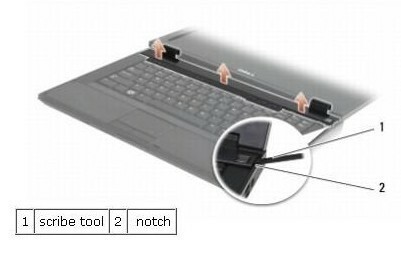 Turn the Dell Latitude E5400 / E5500 to the front and open the display all the way (180 degrees) so that the display rests on your work surface. 2. Insert a plastic scribe into the notch of the raised parts of the hinge cover at the back of the computer, and pry up to loosen the hinge cover. NOTICE: To avoid damage to the hinge cover, do not lift the cover on both sides simultaneously. 3. Lift up on the right notch where indicated with the plastic scribe. Slide the hinge cover to the right and lift it up at the left side. 4. 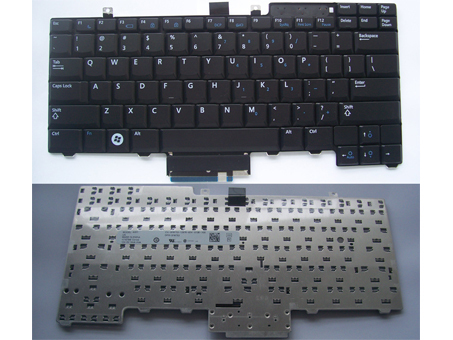 Remove the two M2 x 3-mm screws at the top of the Dell Latitude E5400 / E5500 keyboard. NOTICE: The key caps on the keyboard are fragile, easily dislodged, and time-consuming to replace. 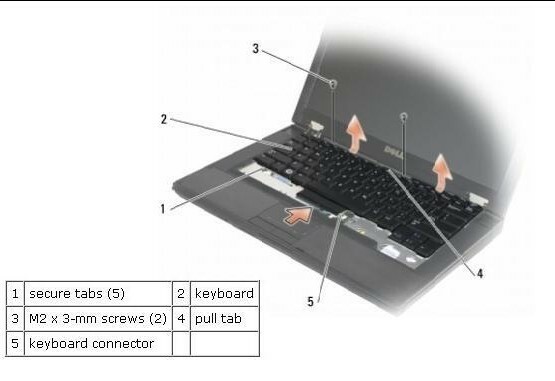 Exercise care when removing and handling the keyboard. NOTE: Lift the keyboard carefully to ensure that you do not pull on the display cable. 5. Gently lift up on the keyboard using the black pull tab and screw hole brackets at the top of the keyboard. Gently rock the keyboard back and forth while pulling it toward the display. 6. Slide the keyboard out of the computer. The connector is part of the keyboard assembly and slides out of its slot when you remove the keyboard. 8. 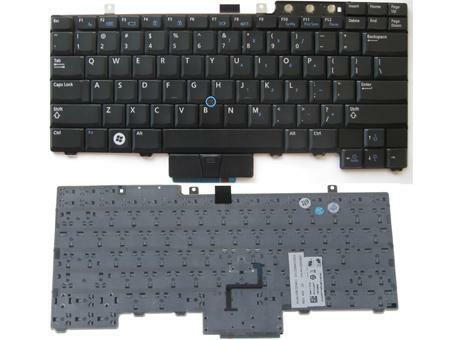 Reverse the procedure to install your new Dell Latitude Latitude E5400 / E5500 keyboard.